After breakfast at the hotel, we set out for the capital of the Chola Empire, Chidambaram, one of Tamil Nadu’s most important holy towns. We are traveling comfortably in a minibus, which has a capacity of ten. With Ravi, our driver, and Jay, our guide, we are only six. Ravi has done an excellent job of driving. He’s friendly, but doesn’t say much. I’m gaining confidence that we’ll probably survive the constant threat of oncoming traffic on our side of the road, though I have asked Jay for the Hindu word for death. We pass a wedding hall, and Jay asks if we’d like to go in. Of course, we would. 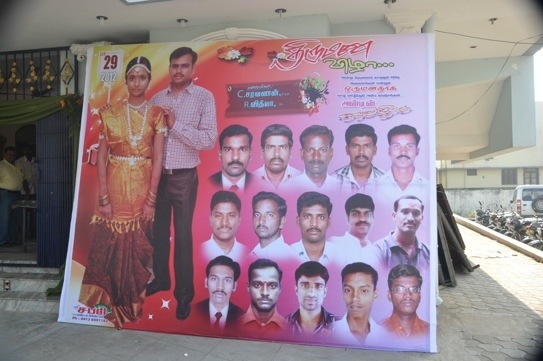 Outside the hall is a big poster with pictures of the bride and groom, as well as smaller pictures, below them, of men who have contributed to the cost of the poster. We are welcomed into the wedding hall, where the wedding ceremony is just ending, and the bride and groom are receiving guests up on a stage. Gifts lay piled up on the floor beneath the stage to help the couple start their new lives together. 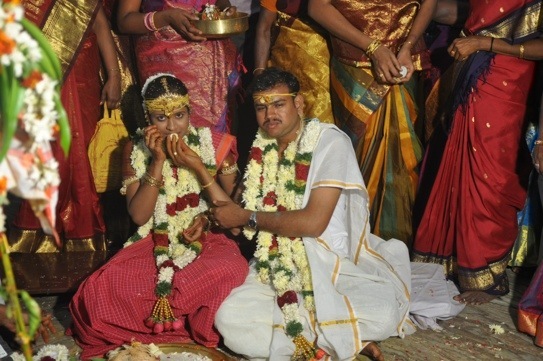 Weddings are huge events in India, with families saving for twenty years to pay the cost. A modest wedding may have 1,000-1,500 guests. Everyone wears their finest dress–a new sari is a must–and gold and jewels abound. A photographer and videographer are recording the event on the stage, and Jay encourages me to go up to photograph with them. The crowd parts to allow me to do this. Guests at the wedding insist that Steve, Karen, Carol and I go up on the stage to greet the bride and groom, which we do. We’re invited to have breakfast several times, but Jay explains to disappointed would-be hosts that we’ve just eaten and must leave. Before we go, we pose for photographs with the bride and groom. On our way out, we’re given gift bags from the wedding, which include a cocoanut and other goodies. As we drive away from the wedding, we pass many guests, women with flowers in their hair, jewels and fine saris, riding on back of motor bikes. In the car, Jay tells us that DVDs will be made of the festivities and sent to wedding guests, and that we will be the stars of the DVD. We leave Ponchiderry, which was granted independence from the French in 1956. Goa achieved its independence from Portugal even later, in 1963. Both are now separate union territories governed by India, but not states. They do elect representatives to the government. Arriving in Chidambara, we head to the Nataraja Templ, which is dedicated to Shiva in his form as Lord of the Cosmic Dance. 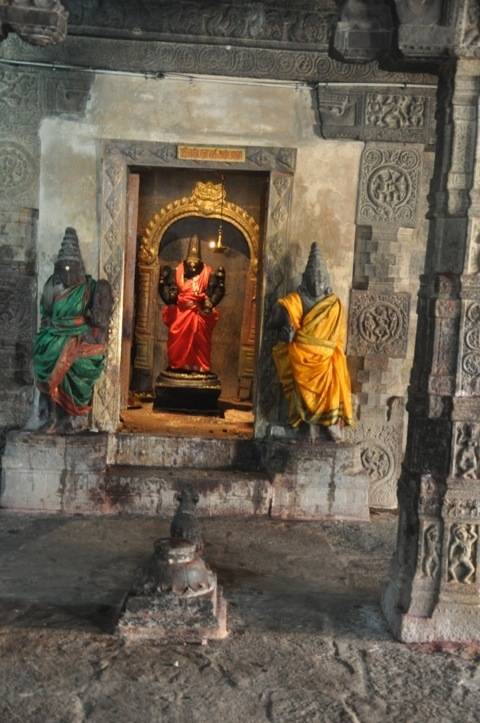 Shiva was the patron god of the Chola kings. The temple area covers sixty acres, dwarfing the temple we saw in Chennai. Jay had told us that it was the goal of every dancer to dance at the temple of “The Dancing Shiva” and we witness several young girls fulfilling their dream. Because of the dance recital we attended in Chennai, we’re able to appreciate the dancing much more than we otherwise would have. 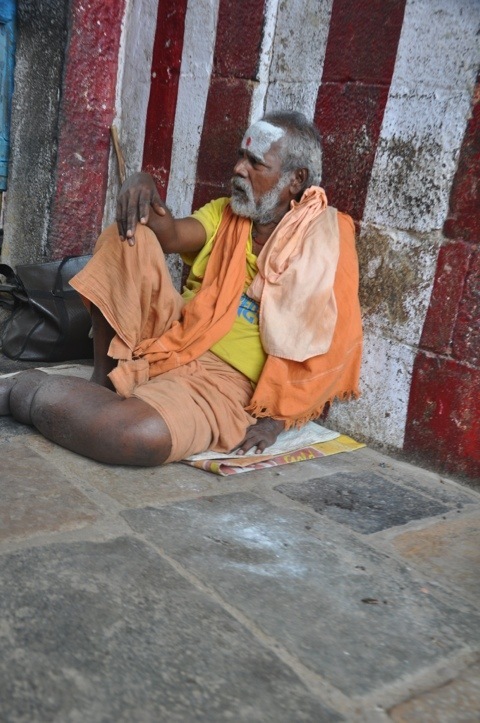 The temple is run by dikshithar priests who have beards and hair tied with a knot in back. They are Brahmins and wear a string around their body as a sign of their status. At this temple, any married dikshithar can serve as priest for any god, so they rotate around to different shrines, but serve the gods 24/7, 365 days a year. 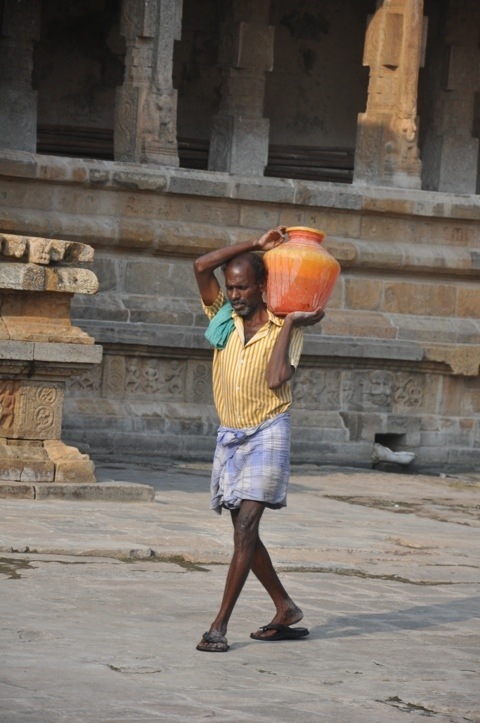 The temple is a hubbub of activity, people old and young, priests, families, beggars. Bells clang, and people crowd to see the priests inside the shrines waving oil lamps in circles. We leave the dancing Shiva and drive a short distance, stopping at a restaurant for lunch. Steve, Karen and Carol all have local, Tamil food on a metal tray, with rice, all of which they eat with their hands. I opt for Chinese–hot and sour soup and Chinese vegetables with rice, all of which is surprisingly good. 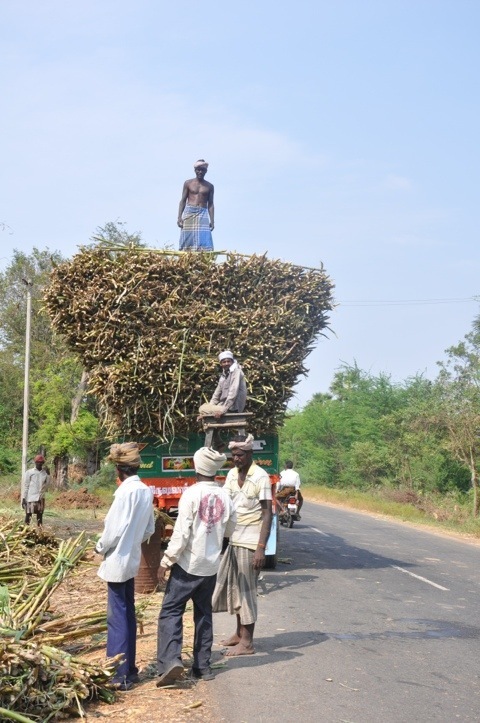 After lunch, we drive through the heart of Tamil Nadu, just missing buses, trucks and motor bikes, passing through small towns with markets, seeing damage from the recent cyclone, tractors loaded high with sugar cane, trucks stacked with hay, oxen ploughing rice fields, moving stores of materials carried on bicycles. 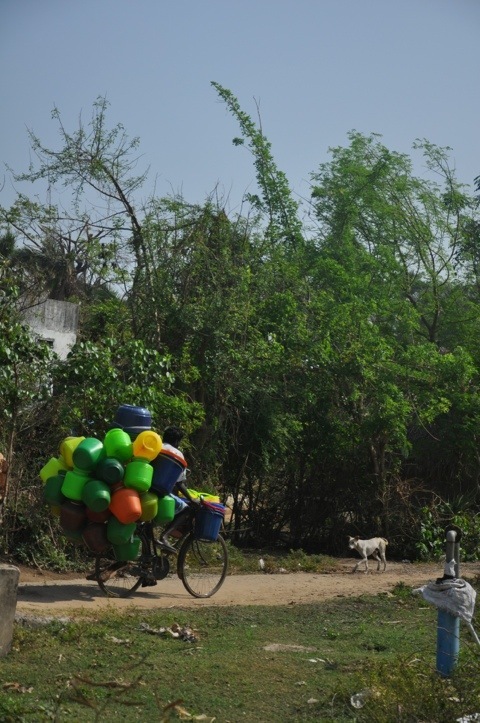 We talk with Jay about everything from trees we see to snakes, rats and mongoose in rice fields to corruption in government and 20-year delays in court cases to the Tamil Nadu political party’s pledge to give poor families a color TV, if elected. This pledge has been honored, with millions of color TVs given to everyone with electricity. The populace favored this over the opposition party’s pledge of rice for one rupee (two cents) a kilo. Who needs rice when you can watch your favorite movies in color? We stop at Darasuram to see the Airavatesvara Temple, the third of the great Chola temples after Thanjavur and Gangaikondacholapuram. Originally called the Rajarajesvaram temple when it was built in 1146, it was renamed Airavatesvara Temple after Indra’s white elephant, who followers of Shiva claim, worshipped Shiva at this temple. Built mainly of granite, the temple has pillars with beautifully carved Apsara and friezes of lively dancing figures and musicians. 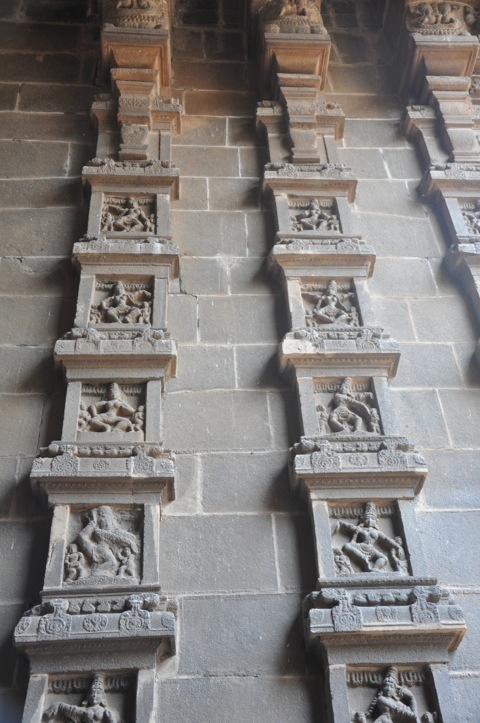 Each of the pillars within the temple illustrates mythological stories showing the penance of Parvati, Shiva’s consort. Though the temple was largely destroyed, it has been carefully reconstructed as an archeological site, not a living temple, allowing us to photograph shrines that we could not take pictures of in a temple that was being used. The temple is definitely worth seeing, but not nearly as interesting as living temples. We continue on towards our hotel, Hotel Mantra Veppathur. Because the hotel cannot be reached in our vehicle, we stop by the side of the road and are ferried in on a large golf-cart type vehicle. We check into a very nice two bedroom villa with a large, tiled common area, which we share with Steve and Karen. Steve and Karen scout out the pool and spa, making massage reservations for themselves at 6:30, and for Carol and me at 9:00. Steve, Karen and I have the large, lovely pool to ourselves. They go for massages, we hang out at he room, then go for a fair dinner at the hotel’s vegetarian restaurant, are joined at our table later by the Sugarmans, leave them for our (excellent) massages, then reconnect briefly in our villa, before retiring.